This summer, I joined USDA Forest Service scientist Andy Whittier for a day of field work as a part of my internship with SRS Public Affairs and Science Communications. We traveled to Green Mountain, NC to check up on an experiment led by research entomologist Bud Mayfield on hemlock trees. The white, fuzzy spots on the underside of this branch are hemlock woolly adelgid ovisacs. Each ovisac can contain up to 300 eggs. Photo by Nicholas Tonelli, courtesy of Wikimedia Commons. Throughout the eastern U.S., the invasive hemlock woolly adelgid is decimating hemlock populations. In nursery experiments on young trees, high levels of sunlight reduced the number of adelgids. Researchers like Whittier and Mayfield are testing that hypothesis in the forest. If the experiment has positive effects, thinning the canopy could supplement other methods like pesticides and biocontrol. The experiment measures how the health of a hemlock tree changes when additional sunlight is introduced. For some of the hemlocks, all of the surrounding trees that shaded it were cut down. In other cases, trees were girdled—a strip of bark was removed from around the tree. Sunlight was added gradually as the girdled trees slowly died. Whittier and I hiked to those experimental trees and took stock of their health by counting dead branch tips, new growth, adelgid ovisacs, and size of the canopy gap. Walking down the hills, everything seemed just as it should be. But more than that, my feeling was that I was a shrub, clinging onto the mountainside and paling in comparison to the larger trees, the river that was flowing somewhere nearby, and the slopes themselves. And so, when we came to our first few hemlocks, I almost identified with them. They were short and rather scraggly, surrounded by taller and sleeker plants. They looked like they weren’t even supposed to be here, like they were barely suitable for this environment. I was used to seeing grander hemlocks—I grew up in Maryland near a swimming hole called Hemlock Gorge. Their memory, if not the trees themselves, was rich and invincible. Later on, we came to a clearing. Researchers had cut a circle in the forest, leaving a lone hemlock tree still standing in the center. The landscape suddenly looked architectural. It felt like winding through narrow, crowded streets and emerging into a sunny plaza. In the center, stood an important and ancient building, some church, museum, or courthouse. The hemlock tree, singled out, had a new sense of importance. 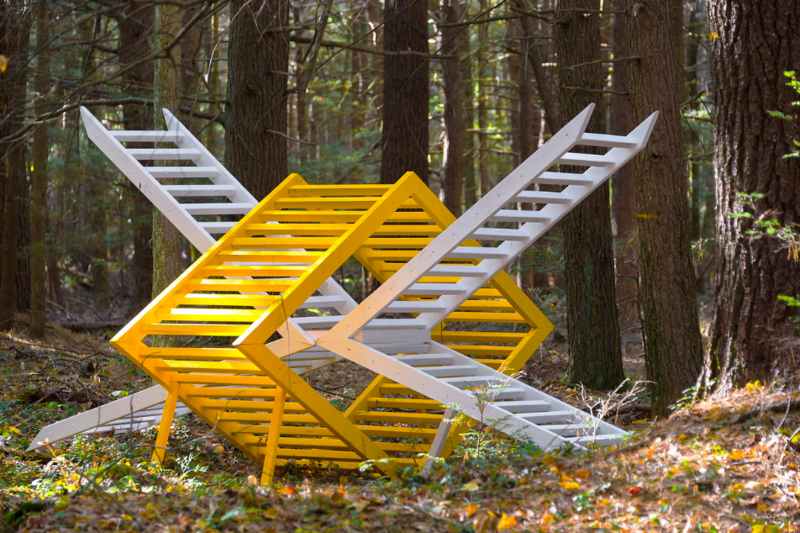 Insect Landing art installation at Harvard Forest, Massachusetts, by collaborators David Buckley Borden, Jack Byers, Aaron Ellison, Salvador Jiménez-Flores, C.C. McGregor, Patrick Moore, Salua Rivero, and Lisa Ward. Photo by Aaron Ellison, used with permission. Recently, I listened to a podcast about the reintroduction of wolves into Yellowstone National Park. The presenter claimed that everything in nature was interconnected. In Yellowstone, he explained, wolves culled the excess elk and changed herd behavior, which let more plants grow, which prevented erosion, which changed the flow of the rivers. Reintroducing large predators, he argued, would save the world’s ecosystems. This is called the trophic cascade effect. It is hypothesized for species like wolves, lions, dingoes, and sea otters. Studies suggest that the elimination of wolves did indeed affect rivers. They also suggest that their reintroduction has improved the growth of plants like aspen and willow in patchy areas. However, others warn against overstating the effects of the wolves on Yellowstone. Decades without the wolves might have caused damage too extreme for their reintroduction alone to reverse. The Yellowstone wolf story is appealing because it says that one simple intervention can restore a lost natural balance — replace one cog, fix one link, and nature will take care of the rest. That narrative makes the solutions to ecological crises seem too easy. We can’t flip a switch that will erase all the negative influence humans have ever had on the planet. What remains worthwhile from that narrative is the idea that every component of an ecosystem has connections to many other components, and that the function of the whole depends on almost every one of its parts. However, once there are broken links in the chain, a solution is hardly ever simple, perfect, or without trade-offs. Similar to the story about Yellowstone wolves, the solution Whittier and his colleagues are exploring to the invasion of hemlock woolly adelgid is not a winner-takes-all deal. It would be impossible to cut a clearing around every hemlock tree in the country. And doing so would have trade-offs—namely, having to kill all the plants surrounding the tree. But the method could be an alternative to other methods which have different trade-offs. Forest managers could select a combination of treatments that would conserve the most hemlocks at the least possible cost. The hemlock may lack the personality of a wolf, but it is in many places the foundation of the forest. That is what was so visually compelling about a hemlock tree standing alone in a clearing. It put the hemlock on a pedestal usually reserved for more charismatic species like wolves or elephants, inviting us to imagine the importance and function of every species in the ecosystem instead of just the popular ones. The experience reminded me that, while astrophysicists and neuroscientists often stand in the spotlight, there are scientists studying things like insects, soil, and fungus whose work is crucial to the preservation of our natural resources. 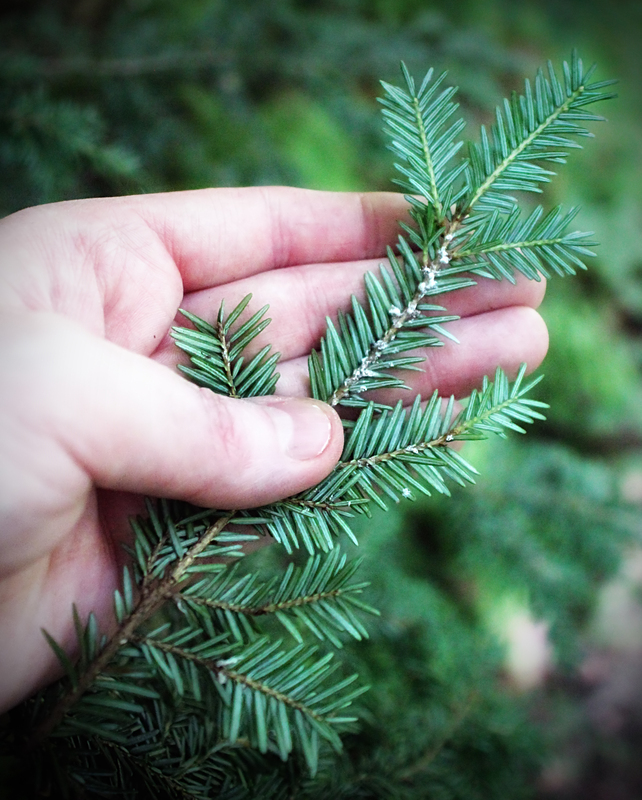 Read about SRS hemlock woolly adelgid research. For more information, email Remi Shaull-Thompson at remics@princeton.edu.